An easier way to maintain the data center. You have multiple products in your data center, and when major downtime occurs, there is no guarantee that only one manufacturer’s machine is the culprit. Rather than dealing with multiple OEMs and referencing numerous contracts with different SLAs, turn to CentricsIT, a third-party maintenance provider. When you sign one simple contract with CentricsIT, we take care of everything. 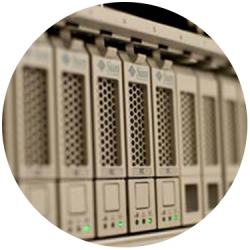 We’re qualified to support all the major manufacturers, including: IBM, Cisco, Dell, EMC, HP, Sun Oracle, and others. Imagine—one phone number, one call, one point of contact for every data center issue. A recent statistic put out by IBM indicated that, on average, 70% of a company’s IT budget is spent on maintenance. In today’s economic climate, is it worth it to pay a premium for OEM maintenance support? Is it worth paying more each year for equipment that just keeps getting older? Is it worth paying top dollar for cookie-cutter SLAs and stagnant customer service? We don’t think so. CentricsIT third party maintenance services will save you 40-70% on your IT costs. We guarantee that you will pay the same price for the same level of service through the life of your equipment—even as it ages; and from customized support solutions to a personal account manager, you’ll gain value in every area of your maintenance plan. Most OEMs feature contract terms that benefit them—not you. Our solutions are designed to make your life easier with flexible terms and conditions. In addition to our standard SLAs, which already beat out the OEMs’, CentricsIT will create a service level specific to your needs. Need different SLAs for mission-critical equipment? No problem. Need an engineer available on weekends? Easy. Need an engineer working in your data center 24/7? Done. With CentricsIT support services, it really is that easy. We know that time is precious when something goes wrong in the data center. But with the OEM, you could wait almost four hours just for a technician to get back to you about your ticket. With CentricsIT, we’ll diagnose the problem and have a part on site within four hours. Request a free quote today and one of our service specialists will respond within one (1) business day.